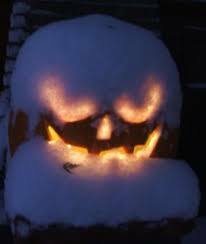 According to the weatherman, we can expect a little "snow on the pumpkin" here in British Columbia today. Thomas FX has been shipping large amounts of artificial snow and ice products to our many retail display and film customers throughout North America all year, so a little real snow here at home is almost an anticlimax. Our phones are ringing off the hook, and the shipping desk is getting busier by the day as orders for our realistic biodegradable and many other artificial snow and Ice products keeping flowing in. Safe, environmentally friendly, realistic, artificial snow and ice products from Thomas FX are preferred by film and television production companies, and entertainment professionals, around the world. Thomas FX fake snow and ice products have also become a preferred choice for retail display designers, advertising agencies, hotels, shopping malls, and special event planners everywhere. To accommodate increasing demand, we are ramping up in-house manufacturing activities. While we carry a large inventory, we suggest you place your order now to make sure your shipments will arrive promptly. Meanwhile, special thanks to the many thousands of in-store Halloween customers who took advantage of the huge savings offered during our October "Monster Prop Inventory Blowout Sale", and our annual "Family Fireworks Sale". Many people commented on the fact that things are changing at Thomas FX and expressed concern that we appear to be getting out of the "Halloween Business". We were never really "IN" the Halloween business. We just got really good at creatively merchandising our spooky set dec products and many people were confused by our experiential shopping displays, mistaking our retail store for a haunted house. For the past number of years, we have only been bringing in those Halloween products and spooky props that are popular with film and television production companies. The number of movies and television productions around the world that have incorporated spooky set dec products from Thomas FX over the years is quite significant. We will continue to offer high quality spooky props and set dec products to entertainment industry professionals, but will not carry products that might confuse or alienate retail consumers who more frequently prefer to shop at big box retail discounters and pop-up retailers. Thanks for your understanding and continued support everyone!